Recommended Ornamental Grasses for Rockwall County. Big Bluestem – Andropogon gerardii (48 – 96 inches) Native. One of the dominant grasses for the American tall grass prairie. It is a willowy grass of great height which blooms in late summer and early autumn with distinctive 3-angled flowers that look like a turkey foot. Grows in full sun in average garden soil, including clay. Tolerates high summer heat and thrives in humidity as well as dryness. In the fall the plant takes on warm tan, bronze, crimson hues. The colors are softened in winter to a warm russet tan with glints of red and bronze. Spread: 2 ft. Deer Muhly – Muhlenbergia rigens (24 – 48 inches) Native. This cool-season perennial grass grows in dense clumps of slender, gray-green leaves. Unlike other cool-season types, it stays green right through summer, even in the driest gardens. The slim flower spikes reach 2-3 ft. tall and are packed with tiny seeds . It lacks the hair-like awns that give the flowers of other muhlys a feathery softness. Full sun to part shade. Does best in moist soil, but its deep roots can plumb underground water. Also tolerates alkaline and saline soils. Spread: 3 ft.
Fountain Grass – Pennisetum alopecuroides ‘Hamelin’ (36 – 48 inches) This is a warm-season grass which offers three-season interest. It makes a vibrant, flowing fountain of fine textured leaves, dark green in summer and warm apricot, almond, or orange in fall, gradually bleaching to pale tan. Flowers midsummer with stems of fluffy foxtail-like spikes spilling outward like a fountain. Full sun/Part shade, does best in moist, well-drained soil. Feather Reed Grass – Calamagrostis acutiflora ‘Karl Foerster’ (60 – 72 inches) A strongly vertical plant that makes an exclamation point in the garden, it provides good contrast to low-mounded perennials or shrubs. Makes a clump of very slender, wiry leaves with much taller flower stalks spiking up through the center clump. The flowers appear in June and the slim seed heads look great all summer into fall turning from gold to silver. Grows in full or part sun. Tolerates poor soil, wet or dry conditions. Spread: 2 ft.
Japanese Blood Grass – Imperata cylindrica ‘Red Baron’ (12 – 24 inches) Grown for its bright red foliage. Leaves become flushed with garnet red as summer progresses, darkening into burgundy toward fall. Used as an accent plant, especially on a west-facing lawn or ridge where it will be backlit by the setting sun. It seldom flowers. Grow in full or part sun. Best in fertile, moist but well-drained soil. Cut back once a year. If all-green shoots appear, it’s a sign that the cultivar is reverting to its species type. Remove and destroy them immediately. Spread: 12 in. Maiden grass – Miscanthus sinensis ‘Adagio’ (12 – 24 inches) Is a compact grower, good for small gardens. Silver-grey foliage and pink flowers bloom in the fall, turning to white. Needs moist, rich soil in full sun or partial shade. Maiden grass – Miscanthus sinensis ‘Cabaret’ (72 – 108 inches) Considered the most beautiful of the Miscanthus. This variegated cultivar has cool green and white foliage. The broad ribbons of almost inch-wide leaves, white in the middle with green edges grow in a weeping cascade. ‘Cabaret’ blooms in early fall, with straight stems of pink flowers that lighten to soft creamy white. Foliage turns tan in winter. Likes sun to part-shade. Maiden grass – Miscanthus sinensis ‘Gracillimus’ (60 – 72 inches) A fine textured, narrow, silver mid-ribbed leaves, form stiffly erect lumps of foliage. Fall foliage color can vary from bright orange to almond. Flowers appear in September, maturing to silver in color into the winter. Maiden grass – Miscanthus sinensis “Morning Light’ (48 – 60 inches) Handsome foliage and showy flowers. A silver grass with a narrow band of clear white on the leaf margins. Upright, arching foliage with flowers 5-6 ft. tall. Flowers bloom late, emerging reddish bronze, and drying to cream. Maiden grass – Miscanthus sinensis ‘Variegatus’ (48 – 60 inches) Variegated Japanese silver grass has white striped leaves. Forms flopping clumps with flowers that rise 1-2 ft. above the foliage in August and September. Plant in light shade to prevent sunburn. Maiden grass – Miscanthus sinensis ‘Zebra Grass’ & ‘Zebrinus’ (60 – 72 inches) Zebra grass has large, arching foliage with yellowish white bands across the leaves. In September, flower spikes bloom pinkish-cooper, 1-2 ft. above the foliage. Can produce runners. Mexican Feather Grass – Stipa tenuissima ‘Pony Tails’ (12 – 18 inches) Mexican feather grass has a denser, more fluid look than the open California species. Clumps of extremely fine foliage spray upward and outward. The flowers appear above the foliage in late spring to early summer; soon changing to yellow-green; then finally gold that will last well into fall. The flowers are very abundant and showy. Grow in sun or part shade. Needs good drainage. Will thrive in lean, sandy, or rocky soils. Does not like dividing, it self-sows abundantly. Plant in a naturalized meadow where seedlings aren’t a problem. Spread: 12-18 in. Northern Sea Oats – Chasmanthium latifolium (48 – 60 inches) Native. A clumping, deciduous grass, very showy, drooping flowers and bamboo like foliage. Prefers rich, deep soil in partial shade with plenty of moisture. Spread: 2 ft. or more. Pampas Grass – Cortaderia Selloana (60 – 72 inches) Very showy grass that is very tough. The foliage makes a huge billowing clump of slender leaves that rise up through the center and arch over to the ground. Cotton-candy like flowering plumes on stiff stalks lift 2 ft. or more above the foliage. Plant turns tan in fall. Used best as a barrier hedge screen than specimen in mid-lawn due to the very sharp edges. Grows in full or part-sun. Not fussy about soil or watering. Prairie Dropseed – Sporobolus heterolepsis (60 – 72 inches) An excellent plant. It forms an upright arching mound of fine, long leaves, emerald green in summer, turning gold with orange tints in fall. The color is stunning in winter. Panicles of small, delicate flowers are held above the foliage in late summer. The flowers have a unique fragrance. Good accent plant, foundation plant , mixed borders, or massed as a ground cover. A good transition plant between manicured gardens and natural areas. Prefers full sun but tolerates part shade. Thrives with ordinary soil and watering, but tolerates dry, rocky soil. Cut back in spring. Spread: 18-24 in. Weeping Love Grass – Eragrostis curvula (12 – 24 inches) Dark green, fine textured, hair-like foliage forms dense tufts. Blooms in the fall. Flowers are blackish olive-purple maturing to a grayish color. Prefers sandy, well-drained soil, ample moisture and full sun. Exceptionally drought-tolerant. Spread: 18-24 in. 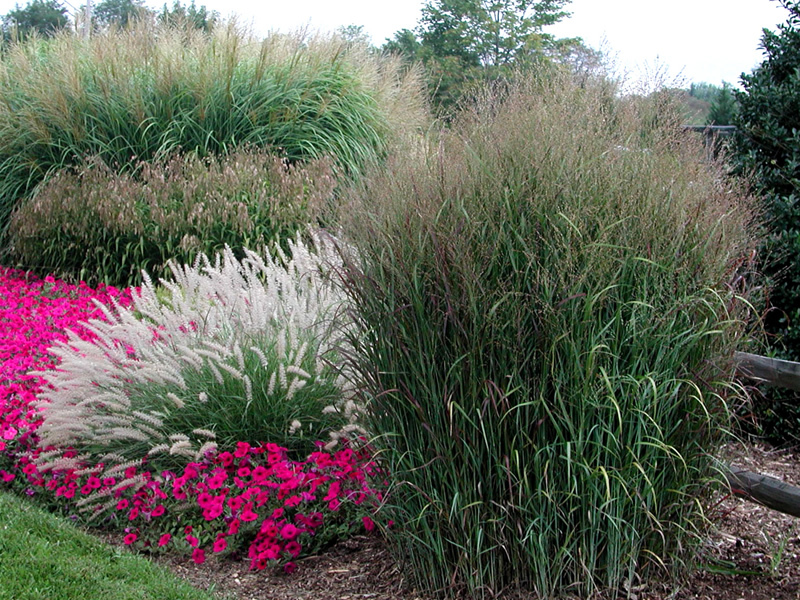 Ornamental grasses add height and visual interest to a garden.